In the tradition of The Economist, New York Times, The Guardian and most other publications that analyse public affairs and thereby form opinions, I am taking the editorial prerogative of sharing my thoughts on the election choice before us in the Tukituki constituency. I intend to vote for Anna Lorck over Lawrence Yule for MP. You of course will form your own opinion, perhaps after reading the essays by these candidates in the pages that follow. Firstly, I simply can’t stand the thought of another National Government. The Nats have shredded New Zealand’s social safety net – intended to protect our neediest in terms of housing, health, mental health, education, and poverty. And when it comes to the environment, they’re still living in an entirely outmoded and discredited paradigm – witness their ‘milk toast’ approach to climate change and inadequate nods toward improving water quality. There’s no sign Nats ‘get’ that our economic activities must accommodate the environment, not the reverse, whether the scale is Hawke’s Bay, NZ or the planet. Their antiquated approaches to both social wellbeing and the environment are typified by Nick Smith, a minister who has badly bungled both housing and water, but manages to hang on because he’s a best mate of Bill English. Enough to disqualify Bill English as PM to my mind. So if nothing else, with a Labour-led Government I’ll be rid of Nick Smith. That’s improvement enough by itself to not use my candidate vote to help deliver a National MP … such as Lawrence Yule. Which brings me to our local major party candidates – Yule and Lorck. I’ve tilted against Yule in the past. My first political effort was the successful campaign to prevent the massive development of Ocean Beach that he supported. But on the other hand, I worked closely with him in support of amalgamation, to the dismay of some of my supporters. So I bear no personal grudge against Yule – I admire his outstanding work ethic, and respect his amassed knowledge of all aspects of local government. But if he is elected MP, he will have escaped political accountability for the gastro debacle – a disaster increasingly portrayed by the official Inquiry as avoidable with proper leadership and oversight. Moreover, if elected MP, he’ll be one more ball-carrier, following the party line, abetting a possible National Government I simply can’t abide. 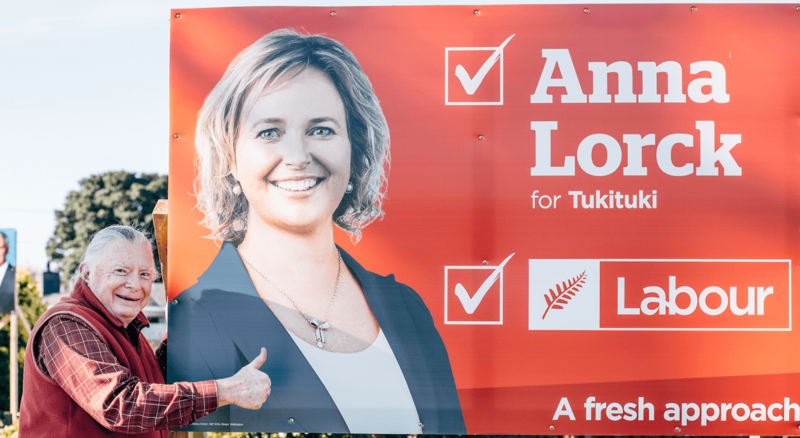 His opponent, Anna Lorck, represents a fresh start for Hawke’s Bay. And perhaps her election might even contribute to a fresh start with a Jacinda Ardern-led Labour Government. That bigger prospect is beyond our control here in the Tukituki constituency, but we can contribute by directly electing one more Labour candidate, who even with the strongest likely nationwide vote for Labour, would not otherwise be seated. The Tukituki constituency deserves the fighter that Lorck has proven she is. In recent years she has demonstrated she is far closer and more responsive to the people of this district and their concerns than Yule (and Foss) – on housing, on schools, on Police, on water. If Lawrence Yule is a skillful ‘finger in the air’ politician, Anna Lorck is a committed ‘heart on her sleeve’ advocate. If Yule is ‘wait and see’, Lorck is ‘let’s organise and make things happen’. If Yule represents a fading past with heavy baggage, Lorck represents an open book and a chance to re-boot. If Yule looks to inherit a seat, Lorck strives to earn it. If Yule is a lulling warm bath, Lorck is a bracing cold shower. But Hawke’s Bay doesn’t need another three-year warm soak in complacency! We have problems to solve and opportunities to seize with fresh outlook and vigour. Lawrence Yule has had his run. It’s time for a change. And whether as an opposition backbencher or a government MP, our province will be getting with Anna Lorck the strong local voice we need on the issues vital to the wellbeing of our community. Yep! We need to change the government!!!! I would be surprised to hear of an instance where anyone was impressed by Anna’s grasp on policy. Just like I’d be surprised to hear anyone say that they were inspired by her leadership. But I would certainly not be surprised to hear them say that Anna had been extremely offensive and abusive. Either in the public forum, or on a personal level. Anna is not a leader. Making a loud racket about things – when you own a PR company – does not demonstrate chops. That’s all she’s ever done. For me the two biggest issues have been housing/homelessness and the massive level of immigration. The Nats simply cant acknowledge there may be a problem there. The other issue i have with national is their new found enthusiasm for PPP deals. (public, private partnerships) They are applying this to schools, hospitals and a myriad of other things. It is just another sneaky, underhand way of stripping public assets. It is transferring what we all should own into private hands. This is also a policy they simply cant let go and this alone would lose them my vote. It is time to get rid of them. I also agree with Paul Jameseon. Anna must be getting very desperate if she is resorting to this type of trashy US type of politicking. Weird to choose someone who is so universally disrespected and seen as one of the most politically self-serving individuals in HB. I would find such an ‘endorsement’ less contrived if Belford had supported Nash as Labour MP in Napier as well in his bid to oust National from government. Given Lorck is a contributor to his propaganda magazine and a friend I would say this endorsement puts her forever in his pocket. This is not the sort of place I want my local MP to be. Universally disrespected??? oh come on Lucy Fern. This tells us more about you than the issue at hand. I myself will vote for NZ First but the reality of it is we will have a Labour Govt (with or without Winnie) and i will be glad to see the end of this callous and cynical National government. The have continued to pursue their policy of universal disrespect for the less fortunate people in this country. Get rid of them and their fellow travelers. They have served no one but their own selfish interests. While in the mood for sharing your thoughts Tom, I hope you have another piece coming out soon recommending voters support their Labour candidate’s vote with a party vote Green. If we truly want that fresh start we need to get a substantive Green presence. Otherwise we leave Winston to his king-maker’s role and god knows what he’ll do with that. (Even John K didn’t get in without other parties) Winston could well choose National – he has before. Many of the policies gaining traction for Labour have been in the Green’s territory for a long time – Labour won’t be able to make them happen with NZ First. Get the Greens in there along with Labour. Let’s really show we care.